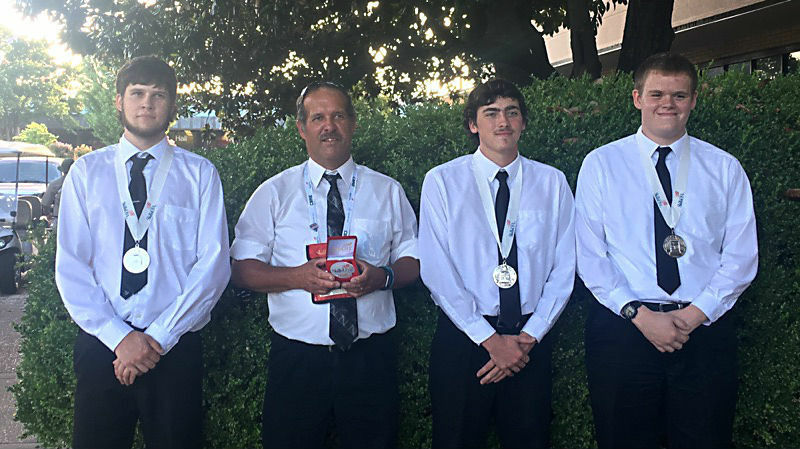 West Side’s welding program continues to reach new heights, with the Metal Fabrication Team of Peyton Dean, Austin Murphree, and Nate Smith finishing runner-up in competition at the National Leadership & Skills Conference. They took the podium this evening at a sold-out ceremony in Louisville, Ky.
Tristen Cottrell, who was first in Arkansas SkillsUSA competition, also competed at NLSC. He finished 15th among 50 competitors nationwide. The Metal Fab team competed against some of the nation’s best welders by completing a project that requires blueprint reading, teamwork, and attention to detail. During April’s state competition, the Metal Fab team finished first, which secured their spot in this week’s national competition. In between the events, they spent hundreds of hours working with instructor Randy Carr and others to hone their skills. At state competition in Hot Springs, Joe Freeland welded in the spot of Austin Murphree; Freeland opted to compete elsewhere in rodeo this week and did not make the trip to Louisville. Pictured: Peyton Dean (from left), instructor Randy Carr, Austin Murphree, and Nate Smith, who won national runners-up in Metal Fabrication a the National Leadership and Skills Conference this week.